The University of Pennsylvania provides access to services and information online in a manner that respects and protects your privacy. This statement describes our information-collection practices and explains how we use and protect your personal information. 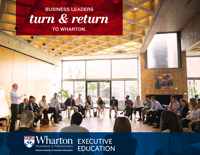 Wharton Executive Education respects your privacy and is committed to protecting your personal data. We may use your personal information to communicate with you and to keep track of the marketing materials you download. 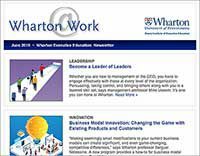 If you do not wish to receive communications from Wharton Executive Education, please unsubscribe. We collect Personal Information through the Services, for example, when you sign up for a newsletter, register an account to access the Services, or make a purchase. We collect Personal Information from you offline, e.g., when you visit our campus or other facilities, attend one of our seminars, place a request over the phone, or contact Penn. To provide the Services’ functionality to you, such as arranging access to your registered account, and providing you with related services or communications. If you do not provide the information requested, we may not be able to provide the Services’ functionality. We will engage in these activities to manage our relationship with you and/or to comply with any legal obligation. To send you promotional related emails, with information about our services, offerings, new initiatives and other news about our organization. For our business and operational purposes. To our third party services providers to facilitate services they provide to us. These can include providers of services such as website hosting, data analysis, payment processing, order fulfillment, event registration, information technology and related infrastructure provision, customer service, email delivery, auditing, and other services. To third parties to permit them to send you promotional communications, consistent with your choices. To respond to a request or to provide information that we, in our sole discretion, believe is important or is necessary to protect our interests. These can include authorities outside your country of residence. For example, when we respond to law enforcement requests and orders or provide information that we, in our sole discretion, believe is important. Certain information is collected by most browsers or automatically through your device. We use this information to ensure that the Services function properly. When you download and use the App, we and our third party service providers may track and collect App usage data. Pixel tags. Pixel Tags (also known as web beacons or clear GIFs) may be used to, among other things, track the actions of users of the Services (including email recipients), measure the success of our marketing campaigns, and compile statistics about usage of the Services and response rates. Adobe Flash technology (including Flash Local Shared Objects (“Flash LSOs”)) and other similar technologies. We may use Flash LSOs and other technologies to, among other things, collect and store information about your use of the Services. We may collect the physical location of your device by, for example, using satellite, cell phone tower or WiFi signals. We may use your device’s physical location to provide you with personalized location-based services and content. We may also share your device’s physical location, with our promotional partners to enable them to provide you with more personalized content and to study the effectiveness of advertising campaigns. In some instances, you may be permitted to allow or deny such uses and/or sharing of your device’s location, but if you do, we and/or our promotional partners may not be able to provide you with the applicable personalized services and content. We give you certain choices regarding our use and disclosure of your Personal Information for promotional purposes. You may opt-out from receiving electronic communications from us. If you no longer want to receive promotional-related emails from us on a going-forward basis, you may opt-out according to instructions in such communications. To the extent these rights are provided to you by applicable law, if you would like to request to review, correct, update, suppress, restrict or delete Personal Information that you have previously provided to us, object to the processing of Personal Information or if you would like to request to receive an electronic copy of your Personal Information for purposes of transmitting it to another entity, please contact us at privacy@upenn.edu. We will respond to your request consistent with applicable law. Your Personal Information may be stored and processed in any country where we have facilities or in which we engage third party service providers, and by using the Services you understand that your information will be transferred to countries outside of your country of residence, including the United States, which may have data protection rules that are different from those of your country. In certain circumstances, courts, law enforcement agencies, regulatory agencies or security authorities in those other countries may be entitled to access your Personal Information. For transfers from the European Economic Area to countries not considered adequate by the European Commission, we have put in place safeguards to protect your Personal Information.